Lane and Ramp Closures on Eastbound Dulles Access Highway Wednesday, July 18, 8 p.m. to Thursday, July 19, 5 a.m.
Wednesday, July 18, 8 p.m. to Thursday, July 19, 5 a.m.
On or about Wednesday night, July 18, Dulles Corridor Metrorail Project crews will perform overhead sign work along the eastbound Dulles International Airport Access Highway (DIAAH). 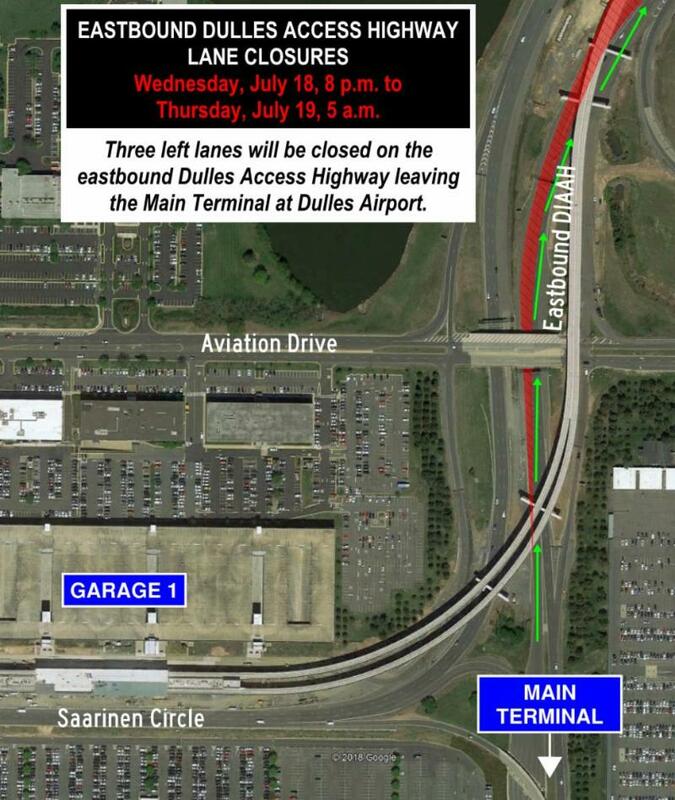 The work will require a triple lane closure on the eastbound DIAAH leaving Dulles International Airport. Single lane closures will begin at 8 p.m. near the Aviation Drive overpass, and will transition to a triple lane closure at 9 p.m. The slip ramp at mile marker 0.3 will be closed. Authorized traffic will use the slip ramp at mile marker 0.7 to access the DIAAH. All lanes and ramps will re-open to traffic on Thursday, July 19 at 5 a.m.